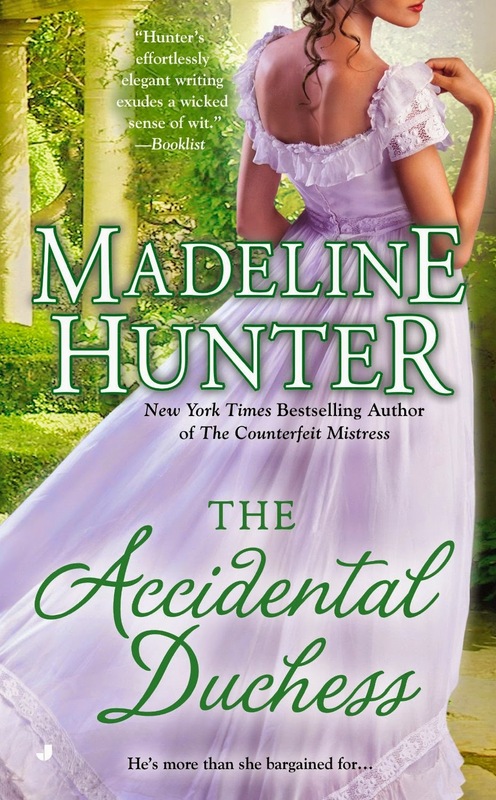 The Accidental Duchess offers Hunter’s usual superbly done romance, with emotional conflict, sexual tension, and shadings of character. At the same time, it ties up plot threads begun in the first book of the Fairbourne Quarter, The Surrender of Miss Fairbourne. The heroine is Lady Lydia Alfreton, sister of the Earl of Southwaite. He has been concerned about what’s going on with her since the series began. In The Accidental Duchess, we find out what has been driving her emotional arc all this time, but I won’t say more lest I spoil it. Lydia amuses herself by gambling, so when she finds herself confronted with blackmail, she naturally tries to win enough at the tables to pay the man off. Unfortunately, the Duke of Penthurst, a friend of her brother, scotches that plan. Her alternative leads her deeper into trouble with both Penthurst and the blackmailer. She gambles her virtue on a draw of the cards with Penthurst and is stunned when she loses (this is not a spoiler, as it’s in the blurb). Now she lacks the money to pay the blackmailer and owes her virtue to the man she most despises. Penthurst is known for his arrogance and his upright behavior--except for the scandalous duel he fought years previously. He killed a friend in that duel and was subsequently tried for murder and acquitted in the House of Lords. As a result, he is estranged from Southwaite and two of their other friends, Viscounts Ambury and Kendale, at the opening of The Surrender of Miss Fairbourne. Led by Southwaite, they have gradually reconciled to varying degrees. Hunter displays her skill as a writer by not making everything fine between Penthurst and all the others at once. Instead, she has slowly brought him back into the fold of this tight group one book and one friend at a time. The Accidental Duchess completes the reunion of these friends, with the last holdout, Kendale, assisting Penthurst with Lydia’s blackmail problem. This book also reveals the full truth about the duel and vindicates Penthurst morally. His refusal to explain himself to his close friends would be difficult to accept in a contemporary story. Since this is set in the Regency era, with his tight, narrow code of male honor, I found it believable. Hunter does friendships very well. Lydia and her sister-in-law and their friends are close, confiding in each other although Lydia holds back with regard to the blackmail. Penthurst, Ambury, Kendale, and Southwaite ride each other in an affectionate way that is endearing. The supporting characters are also well drawn. This was a fitting conclusion to an excellent series. This sounds lovely, and I've added it to my "wish list". Diane, I really enjoyed it, and the cover is absolutely gorgeous "in person." Connie, I loved the perk of reading it early, and I promise, the cover looks even better in "real life." PJ, thanks for the opportunity. I think you'll enjoy it. Catslady, I've loved Madeline Hunter's books for a long time, too. This one was worth waiting for. Dotland101, I think the first one I read was By Arrangement. I loved it and have been a fan of Madeline Hunter ever since. This sounds like a wonderful series. Her books are usually awesome. Quilt lady, I totally agree! I read The Surrender of Miss Fairbourne when it came out & have been collecting the series ever since. I want to read them all together as soon as I pick this one up. Thanks for the review! Sharlene, I'm glad you liked the review, and I hope you enjoy the series. I think reading them back-to-back will be great. I do that sometimes with series.